Education - Florida Carry, Inc.
Florida Carry provides free consultation, and/or referral resources to defense and prosecution attorneys engaged in cases of Federal and/or Florida law regarding firearms, knives, clubs or other "common use" weapons and self-defense. We monitor and assist in civil or criminal cases in Florida and the Federal Circuit Courts that may impact an individual's fundamental rights to Keep and to Bear Arms or other related civil rights, usually on a pro bono basis. 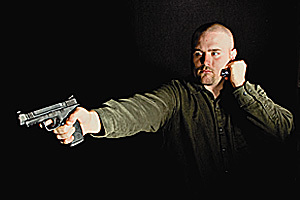 Our dedicated and experienced personnel include a core group of consulting attorneys who are highly adept in applicable areas of law, well qualified statutory experts, firearms instructors, self-defense experts, and tactical experts who are experienced in providing expert witness and consulting services. This capability distinguishes Florida Carry from other available resources and makes us uniquely qualified as a formidable ally in developing and presenting the best possible case for your client. We regularly engage in cases related to self-defense, justifiable use of force, firearms/weapons and ammunition preemption (CH 776, 790.25, 790.155, 790.33 and 790.06), lawful use or possession of firearms and other weapons (790.25), lawful use and possession supremacy (790.25), firearms replevin actions; vehicle firearms storage and workplace requirements (790.25 and 790.251), 10-20-Life, defensive immunity, "Stand Your Ground" or duty to retreat incidents, castle doctrine, and related 42 U.S.C. 1983 actions. If you are a party to relevant a case, please make sure your lawyer contacts us. Lets review a holsters job. The primary responsibility of your holster is toprovide physical protection and retention of your sidearm on your person while allowing you quick and easy access when or if the need arises. With Open Carry you also want a holster that provides some degree of restriction from access to your firearm by others. 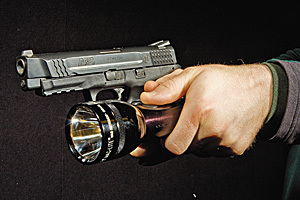 Holsters can accomplish this in several ways to include but not limited to quality of materials, construction, fit, cant and manual retention features. 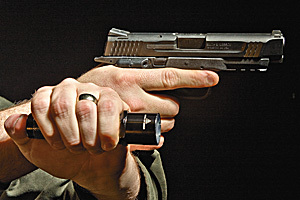 For those wishing to step up a level in retention abilities there are several holster styles available to choose from. The traditional time proven thumb break holsters as the name implies require that the thumb of the strong hand disengage the retaining strap before the firearm can be removed from the holster. 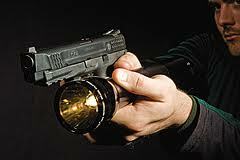 This provides an additional step making availability of the sidearm to other than the wearer more difficult. Other types of retention holsters with more novel retention devices exist such as the Bianchi 82 utilizes a mechanical locking system that locks onto the trigger guard of the pistol and requires the middle finger to activate a paddle lever to release the sidearm before it can be removed from the holster. The Safariland ALS secures the sidearm into the holster by locking into the ejection port. 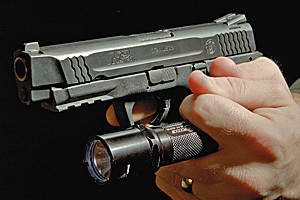 The sidearm cannot be removed from the holster until the locking release lever is actuated. What all of these and many other holsters offer is quality of construction and designs sturdy enough to discourage unauthorized access to the sidearm. 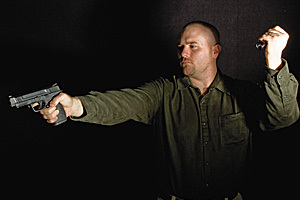 Holsters you should stay away from are the inexpensive and generally poorly made nylon holsters that fit multiple makes and models of sidearm. These holsters offer inferior firearms protection and weapons retention due to poor fit and weak construction.